When it comes to maintaining optimal health, optimizing physical and mental performance, and warding off disease and dysfunction, some nutrients are far more important than others. Two nutrients in particular that are crucial to our all-around health and well-being are eicosapentaenoic acid (EPA) and docosahexaenoic acid (DHA). Together these are known as “omega-3 fatty acids,” which refers to the structure of the molecules. EPA and DHA can be obtained by eating various foods including fatty fish, grass-fed meat, range-fed eggs, and vegetable oils, and by taking a supplement like fish oil. Sadly, studies show that the average Westerner’s diet provides just one tenth of the EPA and DHA needed to preserve health and prevent disease. This is why fish oil supplements are more popular than ever. What most people don’t know, however, is that not all are equal. Some fish oil supplements are far better than others. And that’s why we created TRITON. Furthermore, it’s made from sustainably fished deep-water anchovies and sardines and is molecularly distilled to remove synthetic and natural toxins and contaminants. What TRITON is not, though, is cheap, so if you’re concerned about the price, I understand--you can get a fish oil for a bit less. Remember that you get what you pay for, though, so generally speaking, the cheaper a supplement is, the less effective the formulation. Place your order now and if you don’t absolutely love TRITON, just let us know and we’ll give you a full refund on the spot. No complicated forms and no return necessary. You really can’t lose, so order now and get ready to optimize your mental and physical health and performance and reduce the risk of disease and dysfunction. Not intended for persons under the age of 18. Do not use if pregnant or nursing. Consult a health care professional prior to consumption if you have any pre-existing medical conditions or are taking any prescription medication. Improper use of this product will not improve results and is potentially hazardous to a person’s health. Use only as directed. We took everything you’ve just read to heart when sourcing the fish oil for TRITON. It must be composed of 100% reesterified triglyceride oil. It must include the highest possible EPA and DHA content. It must be sustainably sourced from fish naturally lowest in pollutants. It must be molecularly distilled to reduce contaminants to as close to zero as possible. We vetted dozens of oil manufacturers and finally found one that checked all those boxes. The oil in TRITON is reesterified triglycerides, it’s sourced from deepwater Peruvian anchovies and sardines caught by fisheries that are approved by Friend of the Sea. It contains 2,400 milligrams of EPA and DHA per serving, and it has been processed using enhanced molecular distillation to reduce toxins and chemicals to meet the stringent European Pharmacopoeia Reference Standards (EPRS) as well as the voluntary standards set by the Council for Responsible Nutrition (CRN) and the Global Organization for EPA and DHA Omega–3 (GOED). Fewer than 0.1 parts per million of heavy metals. Fewer than 1.75 parts per trillion of dioxins. Fewer than 3 parts per trillion of dioxin-like PCBs and 0.09 parts per million or less of total PCBs. Fewer than 2 parts per billion of polycyclic aromatic hydrocarbons (PAHs) per softgel. 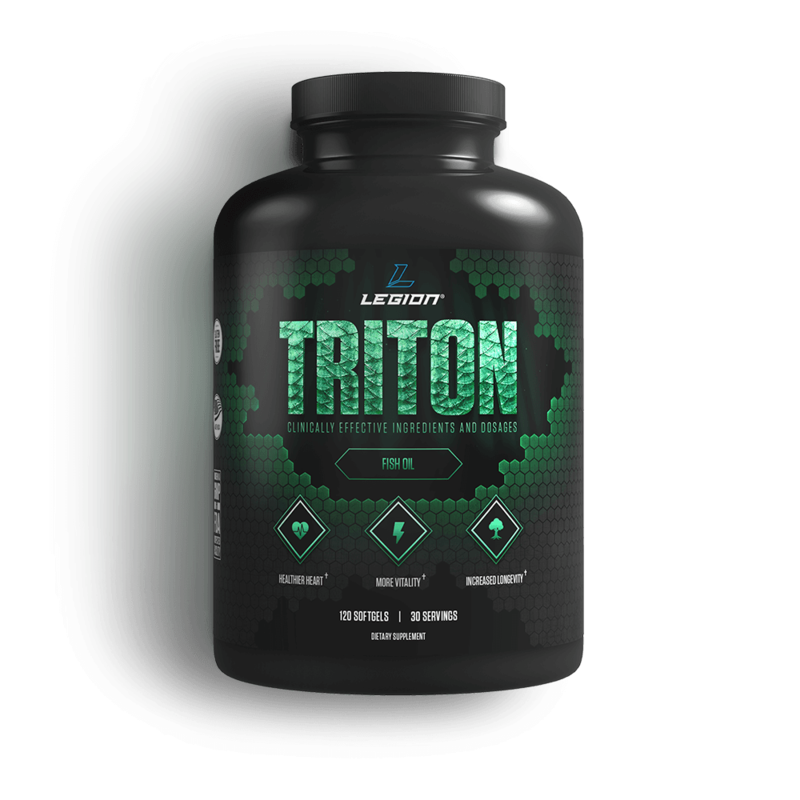 TRITON is also gluten-free, dairy-free, and sugar free, and contains no artificial colors, sweeteners, or flavors. So, while everyone claims to have the best fish oil on the market, we believe we can actually back up such a claim with real purity, real science, and real numbers. 01. Vitamin D: evolutionary, physiological and health perspectives. 02. Prevalence and correlates of vitamin D deficiency in US adults. 04. Dietary magnesium intake in a national sample of US adults. 05. The importance of the omega-6/omega-3 fatty acid ratio in cardiovascular disease and other chronic diseases. 07. Serum omega-3 polyunsaturated fatty acids and risk of incident type 2 diabetes in men: the Kuopio Ischemic Heart Disease Risk Factor study. 08. Effect of eicosapentaenoic and docosahexaenoic acid on resting and exercise-induced inflammatory and oxidative stress biomarkers: a randomized, placebo controlled, cross-over study. 09. Meta-analysis of the effects of eicosapentaenoic acid (EPA) in clinical trials in depression. 11. Serum phospholipid docosahexaenonic acid is associated with cognitive functioning during middle adulthood. 12. Anti-obesity effects of long-chain omega-3 polyunsaturated fatty acids. 13. Omega-3 polyunsaturated fatty acids augment the muscle protein anabolic response to hyperinsulinaemia-hyperaminoacidaemia in healthy young and middle-aged men and women. 14. Effect of dietary fish oil on body fat mass and basal fat oxidation in healthy adults. 15. Polyunsaturated fatty acids in the food chain in the United States. 16. Fish consumption, fish oil, omega-3 fatty acids, and cardiovascular disease. 17. Polyunsaturated fatty acids in the food chain in the United States. 18. Alpha-linolenic acid metabolism in men and women: nutritional and biological implications. 19. Can adults adequately convert alpha-linolenic acid (18:3n-3) to eicosapentaenoic acid (20:5n-3) and docosahexaenoic acid (22:6n-3)? 20. Conversion of alpha-linolenic acid in humans is influenced by the absolute amounts of alpha-linolenic acid and linoleic acid in the diet and not by their ratio. 21. Long-chain n-3 polyunsaturated fatty acids in plasma in British meat-eating, vegetarian, and vegan men. 22. Very low n-3 long-chain polyunsaturated fatty acid status in Austrian vegetarians and vegans. 23. DHA status of vegetarians. 24. Bioavailability of marine n-3 fatty acid formulations. 25. Enhanced increase of omega-3 index in response to long-term n-3 fatty acid supplementation from triacylglycerides versus ethyl esters. 26. Comparative effects of prolonged intake of highly purified fish oils as ethyl ester or triglyceride on lipids, haemostasis and platelet function in normolipaemic men. 27. Bioavailability of marine n-3 fatty acid formulations. 28. Lipolysis of menhaden oil triacylglycerols and the corresponding fatty acid alkyl esters by pancreatic lipase in vitro: a reexamination. 29. Absorption of the n-3 eicosapentaenoic and docosahexaenoic acids as ethyl esters and triglycerides by humans. 32. Bioavailability of marine n-3 fatty acid formulations. 33. Oxidative stability of docosahexaenoic acid-containing oils in the form of phospholipids, triacylglycerols, and ethyl esters. 35. Food web-specific biomagnification of persistent organic pollutants. 36. Factors affecting the storage and excretion of toxic lipophilic xenobiotics. 39. Public health concern behind the exposure to persistent organic pollutants and the risk of metabolic diseases. 40. Potential effects of certain persistent organic pollutants and endocrine disrupting chemicals on the health of children. 41. Evaluation of the global impacts of mitigation on persistent, bioaccumulative and toxic pollutants in marine fish. 42. Persistent, bioaccumulative and toxic substances in fish: human health considerations. 43. Persistent organic pollutants in fish oil supplements on the Canadian market: polychlorinated biphenyls and organochlorine insecticides. 44. Polychlorinated biphenyls (PCBs) contamination and aryl hydrocarbon receptor (AhR) agonist activity of Omega-3 polyunsaturated fatty acid supplements: implications for daily intake of dioxins and PCBs. 45. Alteration of the pharmacokinetics of theophylline by rutaecarpine, an alkaloid of the medicinal herb Evodia rutaecarpa, in rats. 47. Cancer risk assessment, indicators, and guidelines for polycyclic aromatic hydrocarbons in the ambient air. 48. Polycyclic aromatic hydrocarbons and fatal ischemic heart disease. 49. International studies of prenatal exposure to polycyclic aromatic hydrocarbons and fetal growth. 50. Fish consumption, fish oil, omega-3 fatty acids, and cardiovascular disease. 51. Moderate consumption of fatty fish reduces diastolic blood pressure in overweight and obese European young adults during energy restriction. 52. Effect of dietary fish oil on body fat mass and basal fat oxidation in healthy adults. 53. The effects of ingestion of omega-3 fatty acids on perceived pain and external symptoms of delayed onset muscle soreness in untrained men. 54. Meta-analysis of the effects of eicosapentaenoic acid (EPA) in clinical trials in depression. 56. Serum phospholipid docosahexaenonic acid is associated with cognitive functioning during middle adulthood. 57. Skeletal muscle structural lipids improve during weight-maintenance after a very low calorie dietary intervention.